If you’ve come this far, and have determined E15 and/or flex fuels are an opportunity to explore further, there are a few final questions you’ll want to have answered. And as mentioned elsewhere in the Roadmap, if you don’t know, don’t guess! Contact a petroleum equipment installer (if you haven’t already) and put them to work. Several of the items below are topics they can cover for you. DO THE MATH. CHECK YOUR WORK. If you’ve looked at the state pages and determined there are a large number of flex fuel and E15 compatible vehicles, and not very many stations, you may have an opportunity. The “back of the napkin” calculations on the state pages were based on state volume averages, convenience store industry averages, and historical retailer results. Actual retailer results will vary. If you need more information on current retailer results, feel free to contact us via the information at the bottom of this checklist. CHECKLIST Item one on this checklist is: Get a good checklist. This is not one. You’re going to want to have a checklist that you can hang on to after the conversion is complete, to make sure everyone got their work done, record all the details of your conversion or installation, and minimize the time you’ll have to spend with various authorities when they come to check up on you. 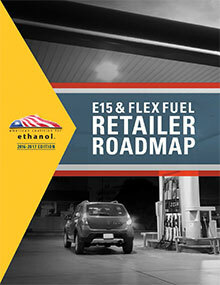 NREL’s Handbook for Handling, Storing, and Dispensing E85 and Other Ethanol-Gasoline Blends has excellent checklists, and RFA’s E15 Retailer Handbook has a good E15 checklist. CAN I? That’s an equipment question. It is possible you already have some (or all) of the equipment you would need to store and dispense E15 and/or flex fuels. If you don’t, you’ll want to find out what else you would need to get into the higher blends business. Contrary to what you’ve probably heard, a large percentage of underground storage tanks and lines ARE compatible with blends of ethanol higher than ten percent. Above-ground equipment is less likely to be compatible with higher blends. NREL’s Handbook (mentioned above) has excellent Tables and graphics that explain which parts and brands are compatible with which fuels, and has hints to help you find the makes, models, and installation dates of your existing equipment. That’s great if you’ve got time on your hands, but we recommend you have your equipment installer do the equipment review for you, since that is information they should have on hand or will be able to find more quickly than you. MAY I? There are a LOT of people to ask “May I?” when you’re adding E15 or flex fuels. If your location is branded, what will the brand allow? What does your insurance company cover? – Those are probably questions you’ll have to get answered by yourself. Others Is there a state Underground Storage Tank (UST) program, and what do they require with E15 or flex fuels? Do building codes and fire codes allow it? should be covered by your petro equipment company. Things like: There is also a registration process for E15, requiring a letter to EPA, adoption of a misfueling mitigation plan, and registration for a fuel quality survey at www.rfgsa.org. Contact us for templates you can use to register with EPA. HOW MUCH? CAN I GET A LITTLE HELP? The first question is definitely your equipment installer’s task, but if the numbers seem “off” to you, contact us. Some installers are not aware of rebate or discount programs manufacturers are offering, and some are aware, but will hang on to the extra profit until they know you’re aware of those rebates and discounts. State and Federal assistance programs in this Roadmap were in effect when the publication was sent to the printer. Check for updates on flexfuelforward.com, or byoethanol.com or contact us for the most up-to-date information, including non-governmental funding opportunities. HOW’S THAT WORKING OUT FOR YOU? If you’re still not sure what you want to do, ask another retailer who is already selling E15 and/or flex fuels. You can find some of their stories on flexfuelforward.com, and we will be happy to put you in touch with other marketers who have already done some of the things you’re thinking about doing. They can tell you what was easy, what was challenging, what still causes problems, and what problems they expected but never had. THE BOTTOM LINE The most successful E15 and flex fuel retailers are the ones who learned everything they could about the products and were excited to offer them to their customers. We prefer to work with marketers who understand the benefits and potential pitfalls and are committed to educating their employees and customers about new fuels that have become available. Those retailers sell more ethanol, gain more customers, and make more money. That’s a big win/win for everyone.